The theme of this first round of posts is “Senses of Cinema, Functions of Film”. We’ve asked our contributors to introduce themselves and their research backgrounds by answering the biggest question in film studies; what does film do? Of course, different films do different things for each of us at different times, but as my own research background is in crisis cinema and as I spent last Tuesday weeping through Ken Loach’s The Spirit of ’45 (2013), I thought I’d take a stab at discussing why we watch what we watch when we’re in the middle of a recession and what we watch is by all accounts pretty depressing. Periods of crisis, whether national and/or economic, often see a rise in fantasy genres including superhero fare, sci-fi, monster and horror films (our resident zombie specialist Sara will have more for you on this at a later date). 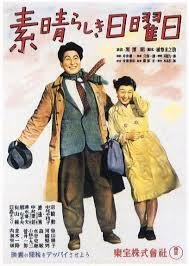 My PhD research focuses on post 1945 Japanese film, which had its fair share of all of the above. 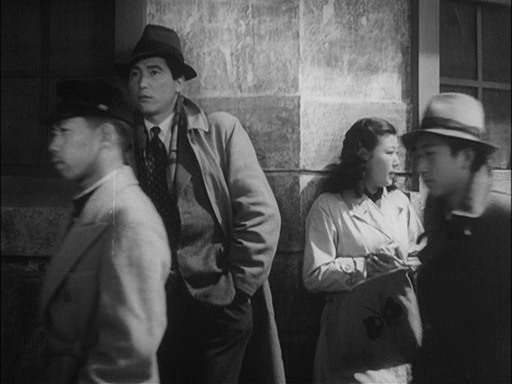 However, late 1940’s Japan also saw a short-lived boom in ‘humanist’ genre films, many of which were pretty similar to Loach’s output in their bleak reflection of the crisis-stricken postwar nation. A quick look at box office figures from the period show that these films were popular with viewers, while their position in the top places on the yearly ‘Best Ten’ lists published by Kinema Junpō magazine every year confirmed their popularity with critics. When you live day to day in economic and social oppression, why queue up to watch the same thing on screen? Wouldn’t you want the placebo of glamour, fantasy, hope? The answer, I think, lies in the affect of images of crisis and suffering. As defined by Baruch Spinoza, ‘affect’ refers to a particular intensity of experience in sensory phenomena. Affect in the cinema is contingent on sensory factors such as sight and sound as well as on filmic narrative. The image is the site of strong affect, which Spinoza defines as a conscious or unconscious emotional response to objects or concepts in the world. Social conditioning, or cultural coding, creates a link between the object and its emotional response. While ‘affect refers generally to bodily capacities to affect and be affected’ (Clough 2007: 2), Giles Deleuze defines affective images as ‘images that arouse an emotional or visceral response’ (Powell 2007: 2). The formal grammar of narrative cinema is geared towards the production of affect, exemplified by use of the close-up, which Deleuze terms the ultimate ‘affection-image’ or ‘affective framing’ (Deleuze 1986: 103), to create a feeling of closeness between the protagonist and the viewer. While expressions of trauma and memories of suffering on film can be cathartic, affect understood as ‘those forces – visceral forces beneath, alongside, or generally other than conscious knowing, vital forces insisting beyond emotion – that can serve to drive us toward movement, toward thought and extension’ (Gregg and Seigworth 2010: 1) can mediate trauma by breaking the cyclical repetitions of its representation. Trauma theorists argue for trauma as a repetitive and involuntary experience (Caruth1995: 59). According to Deleuze and Guattari, repetition in the generic or reoccurring motif creates an ‘expressional value’ which imbues the repeated motif with heightened affect (Deleuze and Guattari 2003: 327). Affect is therefore produced and emphasised by repetition. The traumatic repetition of unpleasurable or anxiety-laden imagery has heightened affect in its very repetition. However, this affect can also ‘serve to drive us toward movement, toward thought and extension’; in short, towards the resolution of trauma. I suggest that screen imagery which expresses trauma can also mediate that trauma as a form of ‘working through’. Dominick LaCapra connects ‘working through’ trauma to repetitive motifs; ‘Working through involves repetition with significant difference – difference that may be desirable when compared to compulsive repetition’ (LaCapra 2001: 148). This desirable ‘working through’ can be achieved by affective identification with filmic imagery. Following scholars such as Miriam Hansen (2000), Isolde Standish (2000), and Mitsuyo Wada-Marciano (2008), I approach film texts as both symptom and mediator of viewers’ anxieties. This function is clear during periods of crises, particularly national crises, as large groups of the nation/viewership share similar concerns at such a time (Alexander 2012). Lauren Berlant argues that aesthetic representations carry heightened affect during periods of crisis, as ‘when the terms of survival seem up for grabs, the aesthetic situation turns to the phenomena of affective disruption’ (2008: 846). In Berlant’s work, affective narrative and imagery represent and mediate crisis in the production of the nation. I understand attempts to represent nations in crisis on film in terms of Berlant’s ‘stories constituted by catching up to a crisis already happening’. The appeal of these stories is located in the ‘collectivity that is also caught up in making and apprehending the present moment’; that is, the citizens of a crisis-stricken nation attempting to re-imagine and rebuild a national identity in the wake of defeat. The postwar viewer of these images can be understood as schizophrenic in the sense described by Ella Shohat and Robert Stam. Stam and Shohat argue for ‘multiple registers’ of spectatorship, understanding ‘the spectator’ as a hybrid of the following identifications. While we must consider representation of national or economic crisis as potentially traumatic to the viewing subject as regards point five, in terms of the viewer’s embodied experience, we must also acknowledge the pleasurable aspects of film-viewing for the spectator, as outlined in the constitutive factors described in points one through four of Shohat and Stam’s description. The coercive power of the film text to fashion the spectator as outlined in point one can provide a pleasurable experience where film style is used to constitute the viewer as part of a national collective. The technical apparatus of film fashions the viewer as the locus of a pleasurable spectatorial fascination. The ‘institutional context of spectatorship’ similarly affects the viewer in a pleasurable manner in the context of the camaraderie of the film theatre or the private film screening with friends. Finally, in its potential to assist in the creation of a national collective memory which can naturalise past experience into ‘cognitively viable patterns as determined by present necessity’ (Orbaugh 2007: 15), the film text appeals to the spectator constituted by the discourses and ideologies of their time. In this way, the spectator as constituted by the film text itself, by the experience of consuming film, and by external factors can experience pleasurable interactions with the film text which balance the unpleasure of traumatic narratives. Shohat and Stam argue that ‘spectatorial positions are multiform, fissured, and even schizophrenic’ (1994: 350) as ‘the same person might be crossed by contradictory discourses and codes’ (Shohat and Stam 1994: 350-351). Elizabeth Cowie similarly suggests that ‘forms of identification in the cinema are extremely fluid’ (quoted in Creed 1993: 153), implying that the processes of personal identification with protagonists and stars are not one-dimensional, but can occur variously and multiply in relation to a single text. A study of the affect of film viewership allows for such multiple and various spectatorial response, as affect allows for ‘a “circus of affective responses” [which] can result from a single stimulus and differ in any one body at different times’ (Wissinger 2007: 232). In this way, the body is imagined as ‘shifting constellation of affects’ (Powell 2005: 20). I understand processes of affective identification as produced by film style, which invites emotional investment in the film as a whole by making the audience feel. At this point it is useful to consider what we mean by ‘identification’ in film studies and how we might theorize the relationship between film and the experience of viewing film. Noėl Carroll reminds us that “If the notion of character-identification is to make sense, it cannot be based on postulating an audience illusion of being identical to the protagonist” (1990: 90). I do not suggest that the viewer of crisis cinema can maintain an illusion of being identical to the protagonist, as this would be an untenably traumatic position within the context of economic and social depression. However, I am interested in thinking of ways in which the viewer’s investment in traumatic imagery and narratives is secured. To this end, I aim towards a theory of ‘affective identification’ which can explain how films with traumatic imagery or difficult narrative themes can find a popular audience base. Affective identification is based on factors other than narrative, which secures audience identification with the protagonists or main themes of a film text and invites investment (both emotional and in the form of time and attention committed to viewership) from a diverse audience variously conditioned as Shohat and Stam describe. Affective identification is achieved by the use of music, soundtrack and particularly striking imagery which invites emotional investment in the film as a whole. I suggest that the viewer troubled by traumatic representations of the crisis-stricken nation can simultaneously, as a schizophrenic spectator, actively participate in or adopt other spectatorial positions in regards to the film text. Spectatorial positions can occur both simultaneously and involuntarily, as “The viewer of hegemonic cinema might consciously support one narrative or ideology, yet be subliminally seduced by the other fantasies proffered by the text” (Shohat and Stam 1994: 351). I’ll try to prove this with an example from my own research into Japanese postwar film. 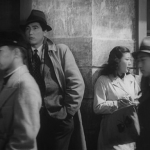 Kurosawa Akira’s One Wonderful Sunday is a perfect example of a text which manipulates this kind of spectatorship, reflecting the bleak conditions of 1947 Japan within the affective visual and aural codes of romance and nostalgia. 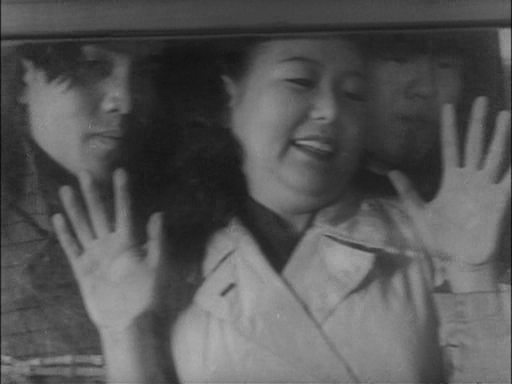 Nakakita Chieko squishes herself against a train window. The film directly engages with the context of poverty, with many references to film-going as a ‘cheap date’ for the impoverished central couple. 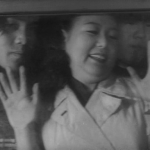 The opening shot shows heroine Masako, played by Nakakita Chieko, pressed up against a train window in a contorted position, signalling the film’s realistic representation of the trials of post-defeat life and the departure of her characterisation from previous ‘feminine’ models based on poise, beauty and elegance. Critics at the time commented on Nakakita’s plain appearance; however her moving performance distracts attention from perceived ‘defects’ in her physical appearance. The central couple lean away from one another. leaking, school-style shoes which reinforce their lack of glamour. Poverty translates to a distance between the couple, as in the first shot of the two together in which they lean against two away-facing walls on a street corner. The two are further separated by his association with ‘reality’ and her association with ‘dreams’; in the first part of the film this is linked to his participation in the war, as Masako observes “You used to have dreams too, before the war”. Her identification as a dreamer touches on the gendered resentments common in war memory in which ex-soldiers articulate non-participant civilians, particularly women, as having their ‘innocence’ safeguarded by the soldiers’ sacrifice in war (Standish 2005: 194). 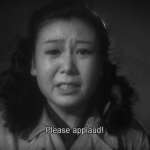 Nakakita breaks the fourth wall to plead with the audience. pleads tearfully, “Help us dream beautiful dreams. Do it for young lovers everywhere.” This appeal to the spectator breaks the ‘fourth wall’ and affects the viewer in its unexpected deviation from the dominant realist style of the film; ‘affect proper coincides with the actor and the film’s openness to often anomalous, unexpected, and always expansive expressions of emotions’ (del Río 2008: 10). Masako’s plea for the couple to be recognised as ‘real’ embodied beings mirrors the spectator’s recognition of themselves in their image; an impoverished viewer on a ‘cheap date’ at the cinema could not but be moved by Masako’s appeal to the universal aspects of their condition, as were critics. 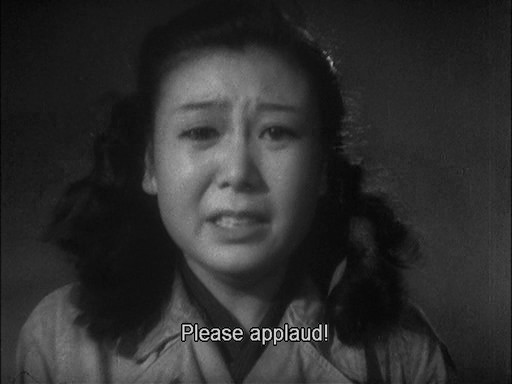 The reflection of everyday postwar hardship combined with childlike innocence in Masako’s characterisation achieves the ‘great emotion’ which she is said to incite in the audience (Kinema Junpō 1947: 21). In many ways, this scene is allegorical of the pleasures of crisis cinema for viewers, in that its ‘sense of fantasy’ is ‘beautiful’ (Iida 1947: 30) though the reality it represents is harsh. The viewer or critic willingly identifies with the couple despite their lack of glamour because they are presented in a ‘touching’ (ijirashii) manner (Togawa 2003: 14) charged with affect. I want to suggest that the affective language of film can mediate harsh representations of the nation in crisis in this way to render traumatic imagery pleasurable. Maybe that’s why Ken Loach had me crying into my coffee with the beauty of his Spirit of ’45 rather than despair at our current economic and national woes. Alexander, Jeffrey C. (2012) Trauma: A Social Theory, Cambridge: Polity Press. Berlant, Lauren (2008b) ‘Intuitionists: History and the affective event’ in American Literary History, vol. 20 issue 4, pp. 845-860. —– (2009) ‘Affect is the New Trauma’ in The Minnesota Review, vol. 2009 no. 71-72, Winter/Spring, pp. 131-136. Carroll, Noėl. (1990) The Philosophy or Horror, or Paradoxes of the Heart, New York; London: Routledge. Caruth, Cathy. (1995) Trauma: Explorations in Memory, Baltimore; London: The John Hopkins University Press. Creed, Barbara. (1993) The Monstrous Feminine: Film, Feminism, Psychoanalysis, London: Routledge. del Río, Elena. (2008) Deleuze and the Cinemas of Performance: Powers of Affection, Edinburgh: Edinburgh University Press. Deleuze, Giles, and Felix Guattari. (2003) A Thousand Plateaus: Capitalism and Schizophrenia, London; New York: Continuum. Deleuze, Gilles. (1986) Cinema 1; The Movement-Image, Hugh Tomlinson and Barbara Habberjam trans. Minneapolis: University of Minnesota Press. Gregg, Melissa and Gregory J. Seigworth ed.s. (2010) The Affect Theory Reader, Durham; London: Duke University Press. Iida, Shinbi. (1948) ‘Nihon eiga hihyō; Subarashiki nichiyōbi’ in Kinema Junpō vol. 1 no. 16 August, pp. 30. Izawa, Jun. (1973) ‘Subarashiki Nichiyōbi’ in Nihon eiga sakuhin zenshū: Kinema Junpō zōkan 11.20-gō, Tokyo: Kinema Junpōsha. Kinema Junpōsha. (1947) ‘Nihon eiga hihyō; Subarashiki Nichiyōbi’ Kinema Junpō vol. 1 no. 12 April, pp. 21. La Capra, Dominick. (2001) Writing History, Writing Trauma, Baltimore; London: John Hopkins University Press. Mulvey, Laura. (1992) ‘Visual Pleasure and Narrative Cinema’ in Mandy Merck ed. The Sexual Subject: A Screen Reader in Sexuality, London; New York: Routledge. Orbaugh, Sharalyn. (2007) Japanese Fiction of the Allied Occupation; Vision, Embodiment, Identity, Leiden: Brill’s Japanese Studies Library. Ōtsuka, Motoichi. (1947) ‘Subarashi Nichiyōbi’ in Eiga Hyōron vol. 4 no. 4, September, pp. 27. Powell, Anna. (2007) Deleuze, Altered States and Film, Edinburgh: Edinburgh University Press. Shohat, Ella and Stam, Robert. (1994) ‘The Politics of Multiculturalism in the Postmodern Age’ in Ella Shohat and Robert Stam eds. Unthinking Eurocentrism: Multiculturalism and the Media, London: Routledge, pp. 338-362. Spinoza, Baruch. (1994) A Spinoza Reader: The Ethics and Other Works, trans. Edwon M. Curley, Princeton: Princeton University Press. Standish, Isolde. (2005) A New History of Japanese Cinema, London; New York: Continuum. Togawa Naoki. (2003) ‘Sengo no konranki, konnanna jōkyō no naka de jidai o haneishita shūsaku ga tanjō’ in Sengo Kinema Junpō besuto ten zenshi 1946-2002, Tokyo: Kinema Junpōsha, pp. 14-15. Wada-Marciano, Mitsuyo. (2008) Nippon Modern: Japanese Film of the 1920s and ‘30s, Honolulu: University of Hawai’i Press. Wissinger, Elizabeth. (2007) ‘Always on Display: Affective Production in the Modelling Industry’ in Patricia Ticineto Clough ed. The Affective Turn: Theorizing the Social, Durham; London: Duke University Press, pp. 231-260.